"Party Time" token, awarded by spawnlt. "Love" token, awarded by saga.karlsson. The current maniphest menu for creating sub tasks assumes that the subtask is of the same subtype as the parent. It's possible to create subtasks of a different type by creating them as new tasks and then setting their parent to be the parent that was originally intended - does that make sense? Requires an extra click in the common case to open the subtask menu. Particularly on mobile, we'd be dedicating a lot of room in the UI to hierarchy, and might need to redesign the element to make better use of space on devices. Adds a lot of options to this submenu that probably almost no one ever uses. Currently, no way to generate those strings in a translatable way -- they'd have to look like "Subtask: New Plant Task" or similar, which is awkward even in English. We could extend forms to include more string customization options. Keep the menu the same. When you click it, you get a dialog asking you to pick a subtask type. Menu options have the translation problem -- you're choosing a form, not a subtype, so they'll say "New Animal Task". We could extend forms here. None of these approaches feel particularly great to me, and I'm hesitant to bring any of them upstream until we have a better sense of how other installs are using subtasks. You can find the right ID for the form by going to the normal create form for a task of that subtype, then copying the ID out of the URL. Replace 123 in the patch with that ID. 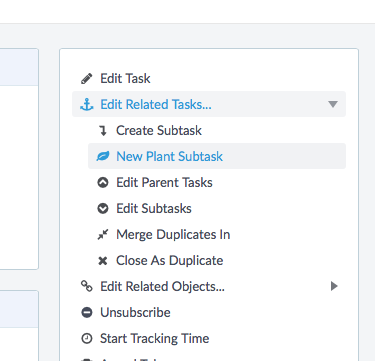 You can add more menu items in a similar way if you have several different types of subtasks you want to make available. thanks - we'll give this a go. It's not clear how often people will need to use this so I agree with your concern about UI clutter. epriestley added subscribers: mirrom, aklapper, dtf, eadler. epriestley closed this task as Resolved by committing rP68b1dee1390d: Replace the "Choose Subtype" radio buttons dialog with a simpler "big stuff you…. epriestley added a commit: rP68b1dee1390d: Replace the "Choose Subtype" radio buttons dialog with a simpler "big stuff you…. When users click "Create Subtask", we now look for a list of possible subtask forms. If we find zero forms, we give the user an error message. If we find one form, we take them directly to that form (similar to the old behavior). If we find two or more forms, we prompt them with a modal dialog to choose between the forms. 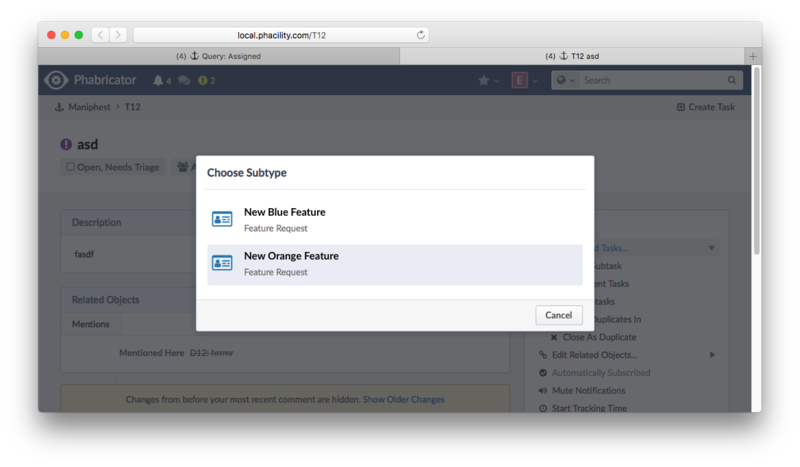 By default, we will now ask the user to choose between all available "Create" forms of the parent subtype. This is a behavioral change. If children specifies a list of subtypes, we'll show "Create" forms for those subtypes instead. If children specifies a list of forms, we'll show an exact list of forms in the provided order. When specifying an exact list of forms, they may be arbitrary forms and do not need to be "Create" or "Edit" forms. If any of these lists only have one form (or the user can only see one form), we'll take the user directly to the specified form. ^ Everything about the new behavior seems very sane and I think it's a really good solution! Thanks @epriestley!